We are in Chicago spending a few days with my husband's family. Family vacations can be... interesting but there have been some bright spots in the last few days. First of all, this book. It is yet another one on my list of books I wonder why I have never read before. Funny and charming with such a wonderfully eccentric family. It kept me chuckling during the whole flight and the following hours long fight with the rental car company about a car with faulty brakes. Did he write more books about his family? I hope so, this wasn't enough. I ran in the grocery store to pick up a few snacks for the hotel room. Every morning is better if you start it with a few chocolate covered digestive biscuits. Plus, the British food aisle had a bottle of elderflower lemonade. I love all the elderflower drinks you can find in Britain but I have never been able to find them in the US. I paid an exorbitant amount for that bottle of lemonade but I don't really care. My kids want to try it but I am not sure I want to share. My husband is originally from Illinois so it is nice to see him sharing his past with the kids. He is taking them to favorite restaurants, planning day trips for later in the week, and making sure they have the essentials which means buying a Cubs hat for our daughter and a Bulls hat for our son. Because they have been carefully taught to follow Illinois teams instead of east coast teams. Priorities here. My daughter is still at the age to be made ecstatically happy by a hotel pool. It is nice to feel like winning parents simply because we have taken her down for a swim in the afternoon. It was 95 degrees today. I don't blame her for wanting to swim. It felt like a steam bath out there. I had managed to bury the memory of just how hot and humid Chicago gets. The restaurant we went to today had gluten free burger buns. That improved my day tremendously. I just realized that the gluten free buns and the cookies seem to contradict each other. For some odd reason, wheat from the UK does not make me sick and does not give me migraines. A doctor said that US wheat is modified so much and over-processed to such a degree that it does not agree with a lot of people. I have a friend who's daughter also can't eat wheat in the US but when she travels in Italy she eats all the pasta she wants and is fine. It sounds crazy but it is true. Tomorrow we are taking the kids to the zoo. My daughter is beyond excited. She has been waiting and waiting to go. 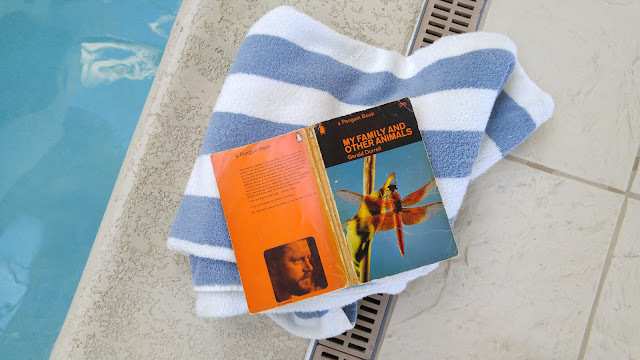 For now though, the kids have found a TV show they agree on, my husband is relaxing after chatting to family all day, and I am going to sink into the world of Angela Thirkell's Barsetshire. If only I had a cup of tea to go with my biscuits. Sounds jolly! I love having small, easily amused kids too. A new box of crayons heals a multitude of wounds! And so do popsicles. It's so nice. That's really fascinating about the wheat from the US vs. Europe. My best friend has a wheat allergy (not gluten, specifically wheat). I wonder what European wheat would be like for her. Hmmm. Oh yes, popsicles. I will be so sad when my daughter outgrows the stage where a popsicle can cure all ills. The wheat thing is kind of strange. I was a bit relieved when my friend's daughter had the same experience and when her doctor said she was familiar with it. It sounds so unusual I kept feeling like it must be all in my head. However, I get really sick if I eat wheat in the US but I don't if I eat wheat from the UK. I agree, how fascinating about the wheat - and what a good excuse to eat proper biscuits :) I am addicted to McVitie's myself, and Scottish oat cakes. I had a long Angela Thirkell binge, reading all the war novels, and I really think I overdid it. Yes, proper biscuits make my day. I like the ginger biscuits if I can find them. I haven't had a chance to look up the sequels. I am glad to know there are more. It looks like I will be placing another book order. Not that I am complaining about that. 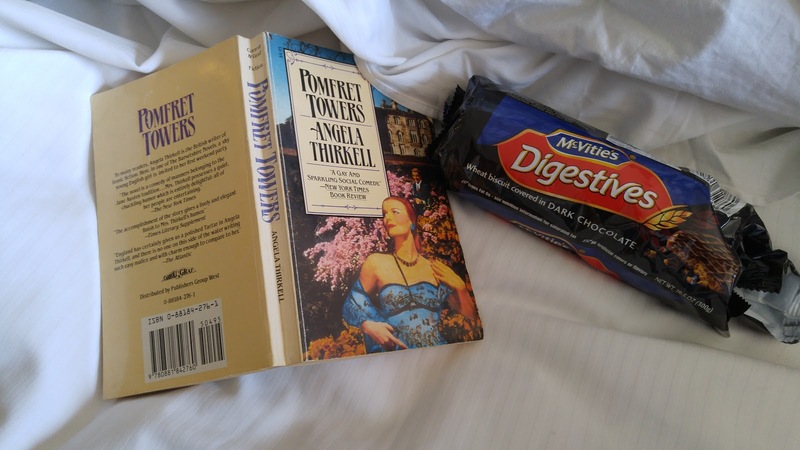 I tend to binge read Angela Thirkell. However, I am still in Chicago so I have a strict order in which to read the books I have brought with me and next up is the third book in the Lymond Chronicles. It´s soo good to know this, because I´m celiac: "but when she travels in Italy she eats all the pasta she wants and is fine". Wow! That´s great! I am not sure the same thing holds true for someone with celiac disease. My friend's daughter and I both have a simple gluten intolerance and find the wheat in Europe much easier to digest.